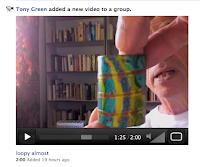 As I've noted here before, Tony Green (of New Zealand) makes poetry objects. One I admire particularly is called "loopy almost." In a Facebook video (2 minutes in length) posted once, he shows the object, describes it, and reads it/reads off of it. Here's your link to the Facebook video. And here are some other related videos by Green.